In general, you must trade off simulation speed against flexibility when choosing either Accelerator mode or Rapid Accelerator mode instead of Normal mode. Normal mode offers the greatest flexibility for making model adjustments and displaying results, but it runs the slowest. Accelerator mode lies between Normal and Rapid Accelerator modes in performance and in interaction with your model. Accelerator mode does not support runtime diagnostics. 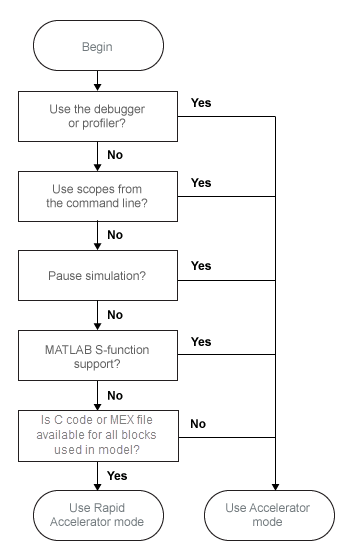 Rapid Accelerator mode runs the fastest, but this mode does not support the debugger or profiler, and works only with those models for which C code or MEX file is available for all of the blocks in the model. For this set of conditions, you will typically obtain the best performance by simulating the model in Normal mode. 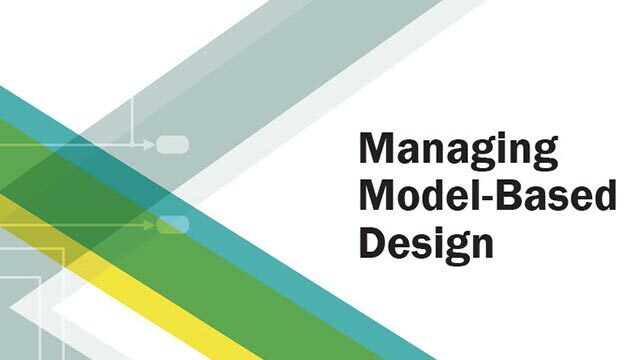 To gain additional flexibility, consider using model referencing to componentize your model. If the top-level model uses Normal mode, then you can simulate a referenced model in a different simulation mode than you use for other portions of a model. During the model development process, you can choose different simulation modes for different portions of a model. For details, see Simulate Model Hierarchies. 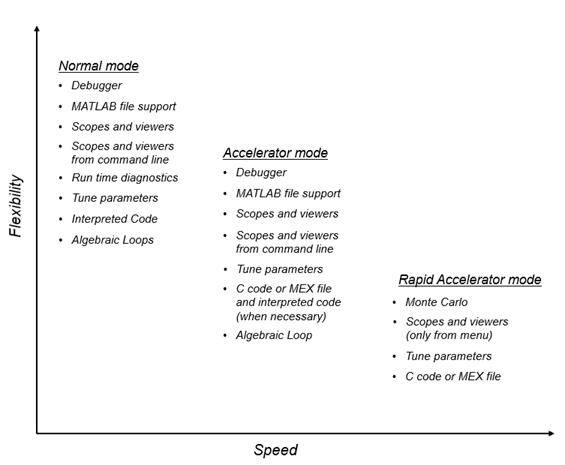 The following table compares the characteristics of Normal mode, Accelerator mode, and Rapid Accelerator mode. Scopes and viewers do not update if you run your model from the command line in Rapid Accelerator mode. Use this decision tree to select between Normal, Accelerator, or Rapid Accelerator modes. See Comparing Performance to understand how effective the accelerator modes will be in improving the performance of your model.